Lapworks prides itself on featuring ergonomically sound products and their latest product is no exception. The 2Loop iPad Handle designed specifically for the iPad 2 is a grip-free, hand-held iPad holder that takes pressure off the wrist and removes the necessity to grip the back of a case. There is a removable two loop finger attachment that supports a steady, non-gripping finger hold. With the 2Loop attachment in place, the cover will swivel 360 degrees. The 2Loop attachment also functions as a typing stand. Also included with the product is an adjustable support arm with a tightening knob that allows multiple options for either horizontal or vertical positioning. The support arm and the 2Loop attachment interchange in a special locking mechanism that is built into the Polycarbonate plastic iPad 2 case. 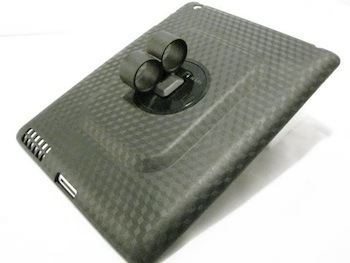 The 2Loop iPad 2 case is available in black. The MSRP is US$39.95, but it is currently on sale from the company web site for US$24.95. 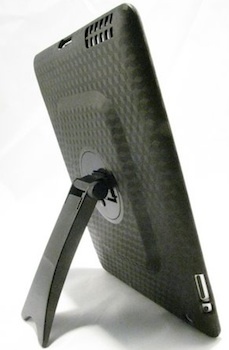 The case feels like hard rubber, but it is flexible enough to easily maneuver and place and remove the iPad 2. The turning mechanism found on the inside of the case is made from the same material and inset enough that it can not scratch the iPad. It took me a couple of minutes to figure out how to successfully attach the 2Loop and the support arm to the case, but once I figured it out, it was both simple and secure. There are several finger configurations that can be used while holding the case. After testing it for about an hour I noticed that I felt no cramping in my hand, something I have experienced with other cases. The adjustments allowed by the support arm were more than adequate for reading or viewing on a table top surface. I do. The case is sturdy and the 2Loop and support arm are hard plastic that appears to hold up well. I had no concerns about repeatedly removing and inserting the support arm and the 2Loop piece. Both pieces remained firmly in place during prolonged use. The price is certainly reasonable for a dual purpose case, and I like the fact that the case itself completely covers all the sides of my iPad. It is not designed to work with the Apple Smart Covers although there is an indication of the company web site that customers have made it work with personal modifications. This case was not designed to work with the new iPad (3rd generation). Can be used in demo mode or desk top mode.